Since its discovery about a decade ago, nanopolymer research has increased tremendously and is revolutionizing the future of the textile coatings sector. This technology cannot be seen by the naked eye, yet it is all around us, as it is used in several applications like home furniture, cars, and now clothing and textiles. Breakthroughs from top nano coating manufacturers have helped to develop unique solutions that have fully transformed textiles and nonwovens, introducing fabrics that possess completely new properties. The application of nanotechnology in textile manufacturing has resulted in the production of fabrics with exceptional chemical resistance, antibacterial properties, water repellence, mechanical strength, and other properties that cannot be realized by other means. Nanotechnology provided the textile sector with the versatility it required to create technical textiles. For example, swimsuits are often produced with a plasma layer, improved by nanotechnology, to repel water molecules and offer gliding comfort to the swimmer. The influence of nanotechnology and its introduction into the textiles sector is a huge reason why the world technical textiles market is forecast to grow several billion by the year 2020 according to Infiniti Research market intelligence professionals. In addition to its outstanding anti-bacterial properties and repellence, nano coatings for textiles also provide other major selling points such as soft finishes, invisibility, wrinkle-resistance, and easiness to clean. In 2014, China beat the U.S. to become the largest economy in the world by producing more than USD 17.6 trillion in terms of goods and services. However, it was just 14 years ago that the U.S. manufactured almost three times as much as China. With the Chinese in the forefront, leading textile coatings vendors in North America had to face the reality that Chinese suppliers were taking over a massive chunk of the market. Currently, buyers are moving away from China to lower cost markets and several Chinese textile manufacturers are seeking ‘Belt and Road’ countries to expand their operations. The textile coatings and manufacturing sector is continually changing in terms of trends, innovations, and geographical strongholds, placing increased stress on the need for market intelligence. Infiniti Research provides expert market intelligence spanning across 100 countries in more than 30 languages. The company offers actionable insights to assist companies in remaining well ahead of the curve and discovering future markets before their competitors. 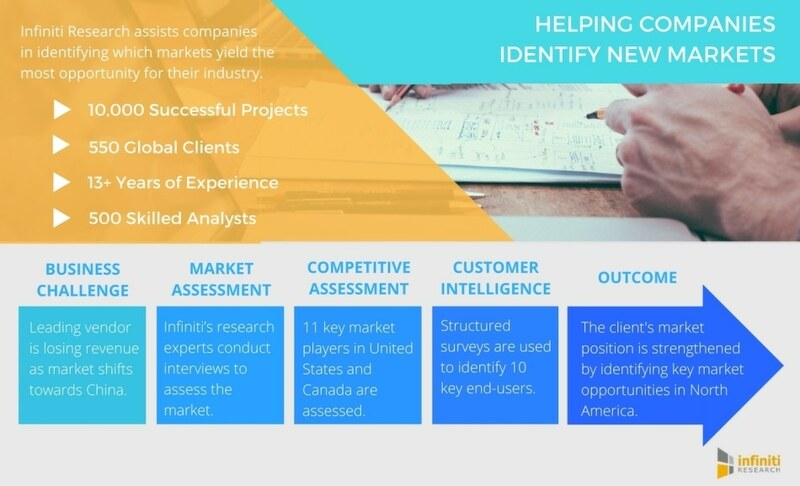 The specialized research analysts at Infiniti have assisted numerous Fortune 500 companies, including top vendors in the textile coatings sector who were hunting for new prospective North American opportunities to compete with Chinese competitors.